We are frequently asked whether our coffee is organic. So, we thought we would take the time to explain our philosophy and commitment to sustainable farming practices. Through the writing of this blog, we would like to highlight the pride and dedication of farmers in Hawai`i. In our opinion, nowhere on earth do farmers have more respect and love for the `aina (land). Malama `Aina (care for the land) is the prevailing ideology of Hawai`i and is reflected in every aspect of Island life. From surfers to industrial farmers, respect is first and foremost. How is farming in Hawai`i different? In Hawai`i, the area in which coffee is grown is much smaller than large, industrial farms. For example, an average sized coffee farm in Brazil is 7.5 ha or hectares (approximately 20.25 acres). Whereas in Hawai`i, the average ha of coffee grown is 3.2 (or 8.64 acres). Much of the land used to farm coffee in Hawai`i is owned by land trusts. The owners of the trusts and the land stewards share a conscious and determined mission of maintaining the viability and health of the local environment. Many farmers grow secondary crops such as mangos, bananas or avocado alongside their coffee plants. What do you mean by sustainably farmed? Our single-estate coffee is sustainably farmed. That means we do whatever we can to give back to the land what we take from it. We do not use pesticides on our crops. In fact, the farming of coffee rarely requires pesticides as caffeine is a natural deterrent to most pests while simultaneously attracting many pollinators. The land in Hawai`i is comparably new in comparison to land commonly used to grow coffee or any other crop for that matter. What that means is that the soil is still lush with all the essential nutrients the coffee plants need and there is little or no need for additional supplementation (read: fertilizer). Of course, we use natural compost produced on and around the farm in our attempts to return the nutrients we harvested. We have chosen not to go the route of getting an organic certification as that would greatly increase the price of our coffee. We believe in the symbiosis between business and the environment. We feel blessed to work with a product where our appreciation is literally palatable. We have an immense appreciation for the land as it blesses us regularly allowing us to share Aloha around the globe. We’d like to send a big Mahalo (thank you) to all of our crew on the farm that work rain or shine with the land that grows our coffee and to all of our customers who support our farm and enjoy it’s bounty. AS KID, I WANTED TO BE A: Pilot or race car driver. I liked going fast and I was much better at the hand eye coordination of games and stuff than sports. I've been involved in the coffee industry for about 16 years. I've been a barista for many years, then a trainer and consultant. I am big on sharing relevant knowledge that will help coffee lovers have the optimal coffee experience. 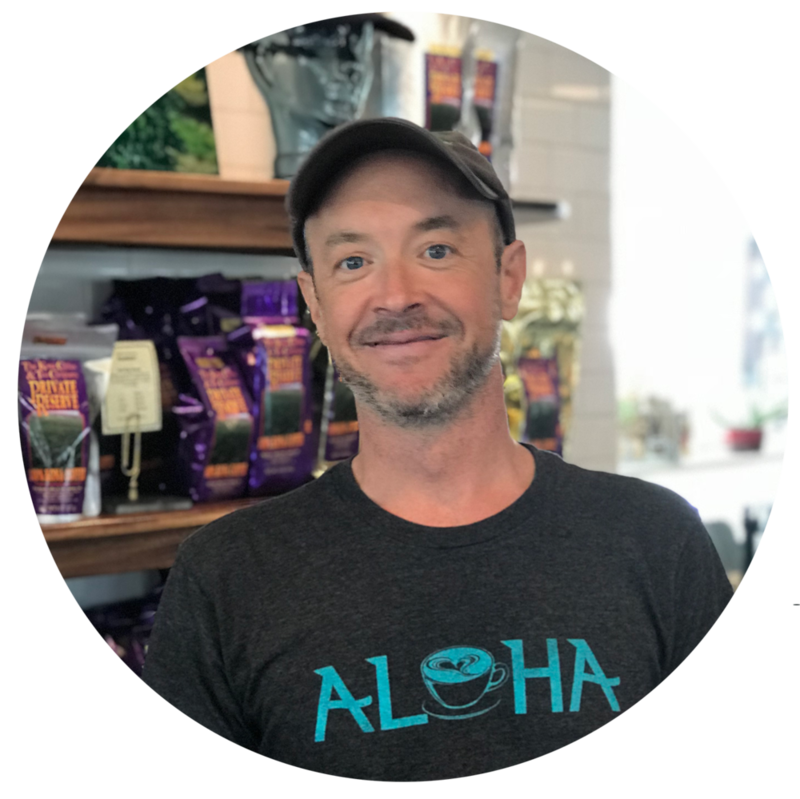 Working with Kona Coffee & Tea Company is like a dream come true. I can't say how rewarding it is to work with such a great product from seed to cup. From the very beginning, being part of the team here, I've felt like family and have been treated like family. The spirit of Aloha is strong as is their dedication to community and quality.